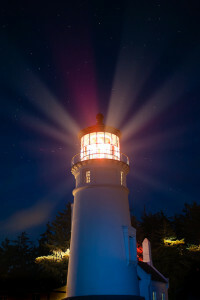 Umpqua River Lighthouse by Anita Ritenour @Flickr and released under this licence. I have a little place in the country that I enjoy staying in during summer weekends and my holidays. It is on the shore of a river estuary and is stunningly beautiful but rather isolated. At night, it is very dark with no street lights and few other lights. Occasionally, on very dark nights when there is little or no moon showing, we see the sweep of a lighthouse across the river. This always amazes me; the nearest lighthouse to where we live is 34 miles up the coast. It shows just how powerful the lamp in the lighthouse is as well as how dark the night is! In the verses in today’s Daily Reflection, Jesus talks about his followers being the “light of the world.” Jesus understands that the world is an inherently dark place, desperately in need of illumination. This illumination it needs comes his followers; they have a vital role to fulfil in breaking light to the world. They are to shine out in the darkness of the world, bringing love and hope into a depressing world. Christians must ensure that their light shines a brightly as possible. Indeed, Jesus says that ” a town built on a hill cannot be hidden.” Christians, if they live as Christ did, and if they strive to live according to the standards laid out in the beatitudes, will be visible to all; it will be impossible for them to blend into the darkness, since their lights will shine so brightly. Their way of living, their standards, will be so radically different to those of the people around them that their distinctiveness will be evident. Why is it so important for Christians to shine brightly as ‘the light of the world’? Jesus explains that by doing so, others will ‘see [their] good deeds and glorify [their] Father in heaven’. In other words, shining as lights in the darkness of the world will bring people to faith. This makes sense since it is Christ’s light that shines through us when we follow his commands. Like moths, people living in the darkness will be drawn to the light, initially to the light that we cast, and then to the source of that light, Jesus Christ. Of course, it is important that we ensure that we do not attempt to hide our light by blending in to the society in which we live; we must maintain the brightness of our lights at all times. If we do not ‘shine before others’ not only are we failing Jesus by not taking seriously our responsibility as the light of the world, but we are also risking extinguishing the light within us. After all, if you hide a lamp by placing it under a bowl, the light will eventually go out. Why not think today about how you live as the light of the world. Is your light shining brightly? Are your good deeds evident to those around you? Are you pointing all those with whom you come into contact towards the source of the light, to our saviour Jesus Christ? I have also written about this verse in this article: How To Change the World. This entry was posted in Bible Articles, Bible Reflections and tagged Matthew. Bookmark the permalink.